These sculptures by Michael Wetzel appeared in a two-person show (with Jeffrey Tranchell) called Standards of Living at Honey Ramka gallery last year. Of the artworks in the show, these objects most drew my eye and lingered in my thoughts afterward. These are blurry screenshots I made from the gallery's photos and don't do justice to the intricacy of the work, but serve as visual notes to accompany a passage from Fiasco (1986), a Stanislaw Lem novel I am reading for the first time. Lem is describing a field of bizarre, fanciful-seeming mineral deposits on the surface of Saturn's moon, Titan. For the very reason that here nothing served a purpose -- not ever, not to anyone -- and that here no guillotine of evolution was in play, amputating from every genotype whatever did not contribute to survival, nature, constrained neither by the life she bore nor by the death she inflicted, could achieve liberation, displaying a prodigality characteristic of herself, a limitless wastefulness, a brute magnificence that was useless, an eternal power of creation without a goal, without a need, without a meaning. This truth, gradually penetrating the observer, was more unsettling than the impression that he was witness to a cosmic mimicry of death, or that these were in fact the mortal remains of unknown beings that lay beneath the stormy horizon. So one had to turn upside down one’s natural way of thinking, which was capable of going only in one direction: these shapes were similar to bones, ribs, skulls, and fangs not because they had once served life -- they never had -- but only because the skeletons of terrestrial vertebrates, and their fur, and the chitinous armor of the insects, and the shells of the mollusks all possessed the same architectonics, the same symmetry and grace, since Nature could produce this just as well where neither life nor life’s purposefulness had ever existed, or ever would. Addendum: The first sentence is eloquent and rather long and at first it seemed ungrammatical (perhaps it's the translation from Polish). The core of it is "nature could achieve liberation" but the word "nature," surrounded by other clauses, tends to get swamped, or appears to be paired as a synonym with the word "survival" that precedes it. Regardless, once you have it, this passage is a good example of Lem's Borgesian talent for extrapolation from known phenomena to create "unthinkable" vistas and thought processes. It comes at the end of a description of a volcanic crater where minerals have run riot over millions of years of geological time to create landscapes that seem like amalgamations of our worst nightmares. 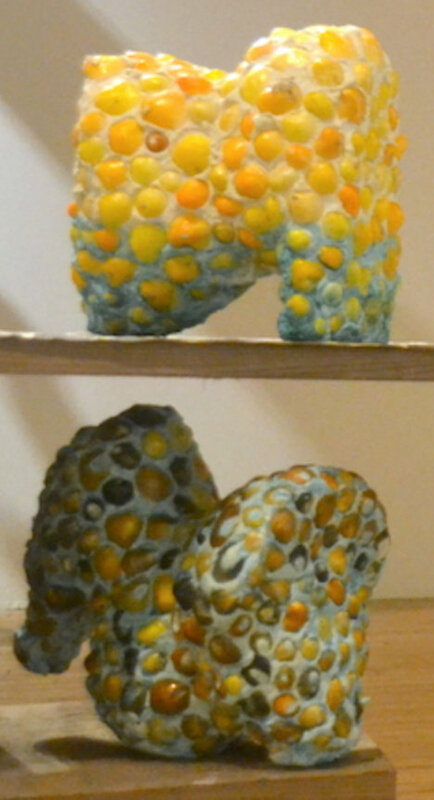 There is beauty there, as well, which got me thinking about those quasi-biological Wetzel sculptures. Lem is one of the most visual sf writers, and his book Solaris has been stripped down by film directors into something like a simple love story, when the essence of it is his poetic description of the surreal life forms constantly churning in the Solarian "ocean" and human inability to ever understand them.